June 14th, 1807 at Friedland in Ostpreußen (today Pravdinsk, Province of Kaliningrad, Russia), a few kilometers east of Eylau. French army (66,000 men) under Marshal Jean Lannes, then under Emperor Napoleon the First. Russian army (84,000 men) under General Levin August Gottlieb Theophil (Leonty Leontyevich), Count von Bennigsen. Grande Armée: 1,500 killed; 4,000 injured. Russian army: 25 000 men killed, lost or injured; 10,000 prisoners. "Battle of Friedland, June 14th, 1807" (detail). Painted 1835 or 1836 by Emile Jean Horace Vernet. On May 25, 1807, almost four months after the Battle of Eylau, the Grand Armée set off as the continent enjoyed the beginnings of summer on the shores of the Baltic. Napoleon I was headed in the direction of Königsberg (today Kaliningrad) which was defended by Levin August Gottlieb Theophil von Bennigsen. The numerous munitions and supply reserves found in the city were vitally important for his troops. The Russians, determined to protect the city, took the offensive. After a few inconclusive skirmishes, the first major encounter took place at Heilsberg on June 10, 1807. With 50 000 men, Jean-de-Dieu Soult and Joachim Murat , soon to be supported by Jean Lannes, attacked nearly 100 000 well-entrenched Russians. The battle was quick and deadly. Ten thousand French were dead or wounded while the Russians remained in position. But the next day, Bennigsen decided to evacuate the fortified camp fearing for his lines of communication. He moved his troops to the right bank of the Aller along which he advanced toward Friedland. He intended to re-cross the river on a bridge before marching for Königsberg. A strong detachment of the vanguard was tasked with scouting the route and crossed the river on June 13. At the break of dawn on June 14, the rest of the Russian army met with the advance party and came up against Marshal Lannes on the plain near Friedland. Bennigsen, aware of his immanent arrival, did not find cause for alarm. He had no idea that the rest of the French army was so nearby and thought of taking advantage of the situation to destroy and isolated army corps. But events did not unfold as he expected. Unable to keep the Russians back from the field, Lannes managed nonetheless to hold on to the village of Posthene and the surrounding wood. With the arrival of additional units sent by Napoleon I, it became possible for the French to contain the Russians until the main force could arrive. Three units set to work with determination: the corps commanded by Marshal Adolphe Édouard Casimir Joseph Mortier, General Emmanuel de Grouchy's dragoons and the cuirassiers under the command of Étienne Marie Antoine Champion de Nansouty. The Imperial Guard, with Napoleon himself, arrived around 1 p.m. Marshal Michel Ney and his troops arrived two hours later and were followed by General Victor at 5 p.m. At last, the full force of both sides were face to face. The right was commanded by Michel Ney with the support of the dragoons under Victor de Fay de La Tour Maubourg. Lannes was in the centre with Nansouty as support and Moritier was on the left. The Imperial Guard and the First Corps commanded by Victor made up the reserve (the wounded Bernadotte having left Victor in command). The Russian position was precarious. They had advanced onto a small plateau surrounded by a meander of the Aller whose only access to the plain was directly in front of the French. This meant the river was behind them. The battle began at 5 p.m. Ney was the first to attack. 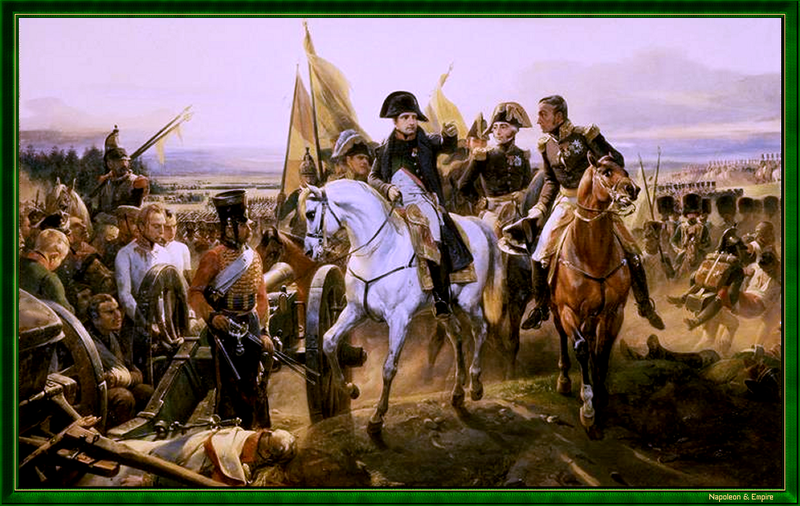 Following Napoleon's battle plan to the letter, he marched right toward Friedland leaving Latour-Maubourg to repel the Russian cavalry charge against his right flank. Victor's reserve was quick to take up the position left by Ney. Victor's artillery, commanded by General Alexandre-Antoine Hureau de Sénarmont, supported Ney's offensive with 30 canons from the centre of the plain. The Russian units were demolished: overwhelmed, they were pushed into the Aller or back toward Friedland. Arriving in front of the town, Ney was momentarily surprised by the Russian Imperial Guard on foot and horseback. He was soon supported by the division commanded by General Pierre Dupont de l'Étang and continued his advance. The fighting quickly advanced to the gates, streets and houses of Friedland. At this point, Napoleon sent Mortier and Lannes to attacked the Russian right wing made up of four divisions under the command of General Gortschakov, though he ordered them to temper their usual ferocity. This manoeuvre gave Ney the time to cut off the Russians to prevent a retreat after capturing the town and its bridges. Aware of the danger, Gortschakov sent two divisions to Friedland, but it was too late. Ney easily cut them down. The two other divisions attempted an orderly retreat. However, Nicolas Charles Oudinot's grenadiers together with the riflemen from the Imperial Guard under the command of Anne-Jean-Marie-René Savary and Mortier's troops cut off the town driving the Russians into the river. With surrender out of the question, those who did not die in the fighting jumped into the Aller. Over the course of the day, their losses rose to 10 000 dead, 15 000 wounded, and 10 000 taken prisoner. The French also captured 80 canons, a large number of artillery wagons and several regimental flags. On the French side, the losses were far smaller: 1 500 killed and 4 000 wounded. The following night, the Emperor pitched his camp on the battlefield amidst his guard and the rest of the French army. This website has been designed for a screen resolution of 1280 x 800 pixels. Last update: 2017-10-13 20:59:41.